Barely seven days can roll by at the moment without some new graphics card release or announcement and today we’ve got the launch of AMD’s newest Polaris-based card: the Radeon RX 470. Check out our in-depth review of Sapphire’s version of the AMD RX 470. The final pricing is a little higher than we were expecting – or maybe hoping – it would be, with the SRP of the 4GB stock-clocked RX 470 coming in at $179 (£159). Ideally it would have been closer to the $150 mark, but given the performance of the latest Polaris card you can understand why AMD have chosen to price this and the RX 480 so close together. With some simple overclocking there is precious little performance difference between the two Radeons – if the costs were further apart going for the RX 470 would be a no-brainer, cannibalising potential RX 480 sales. The performance is so close because so is the architecture. 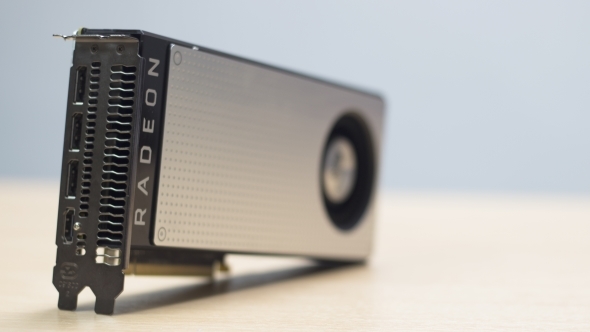 AMD often release their graphics cards in pairs using the same silicon, so the RX 470 is using the exact same Polaris 10 chip as the existing RX 480 [https://www.pcgamesn.com/AMD-RX-480-review-benchmarks], less four compute units (CUs). That means the RX 470 has 2,048 GCN cores against the RX 480’s 2,304, a few less texture units and the exact same 32 render output units (ROPs). Combined with the fact it’s sporting a boost clockspeed only just shy of the RX 480 too – 1,206MHz vs 1,266MHz – the performance delta between the two is pretty minimal. The performance is so close because so is the architecture. AMD often release their graphics cards in pairs using the same silicon, so the RX 470 is using the exact same Polaris 10 chip as the existing AMD RX 480, less four compute units (CUs). That means the RX 470 has 2,048 GCN cores against the RX 480’s 2,304, a few less texture units and the exact same 32 render output units (ROPs). Combined with the fact it’s sporting a boost clockspeed only just shy of the RX 480 too – 1,206MHz vs 1,266MHz – the performance delta between the two is pretty minimal. Because AMD is not releasing reference versions of the RX 470 itself there will only be cards appearing created by the board partners, such as the Sapphire card we’ve put through the wringer on our test bench. Unfortunately that also means there will be a lot of overclocked versions of the RX 470 out there. Every penny counts at this end of the market and the price premium a factory-overclocked card adds to the cost decreases its value by more than the performance boost you will get. And when the overclocked Sapphire card we’ve tested costs only a little less than a 4GB RX 480 in the UK, it’s hard to make a case for such tweaked versions. We are though looking forward to seeing stock-clocked AMD RX 470 cards appearing at closer to the SRP. The overclocking headroom in our Sapphire card makes us think it could become a great little budget gaming card if you want to do some tweaking yourself. Speaking of great little budget cards…the AMD RX 460 is launching next week. Given the pricing of the RX 470 that’s probably going to land with an SRP somewhere around $129 (£119) when it gets released on August 8. 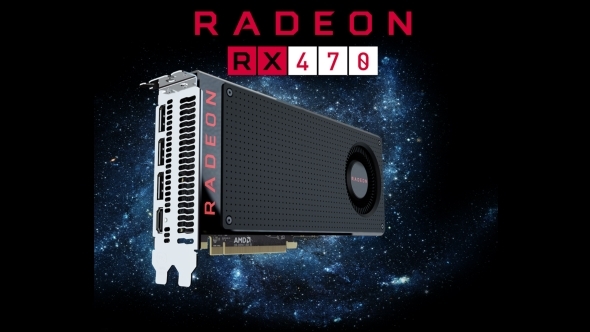 The RX 460 is based on a different GPU, the Polaris 11 chip. It’s not quite the full version of Polaris 11 though, with 14 CUs compared with the full-fat chip’s 16 CUs, but that could mean we’ll see a fully-unlocked RX 465 sometime in the future. That configuration gives it 896 GCN cores, 48 texture units and 16 ROPs. It is then significantly slower than either of the higher-end Polaris cards, but that also means it has a TDP of less than 75W and comes without a PCIe power connector as standard. 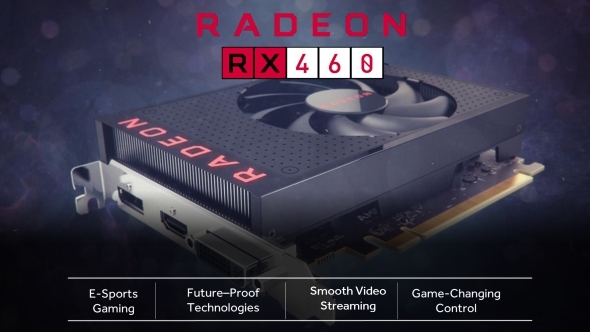 We’ll probably see some board partners adding opportunities for extra juice with a 6-pin PCIe connector, but in its most basic form the RX 460 will take all the power it needs through the motherboard. That’s one of the reasons the GTX 750 Ti remains one of my all time favourite GPUs – it meant any ropey off-the-shelf PC could be instantly turned into a gaming rig with a simple, drop-in upgrade for less than a ton. I’m really hoping the RX 460 lives up to that same promise – AMD say it’s been designed for 1080p gaming in titles like Overwatch, CS:GO and League of Legends at over 90fps on high settings, so it’s sounding pretty good so far.